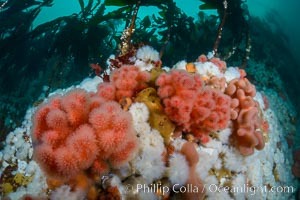 Pink Soft Coral (Gersemia Rubiformis), and Plumose Anemones (Metridium senile) cover the ocean reef, Browning Pass, Vancouver Island Gersemia rubiformis, Gersemia rubiformis Photo. 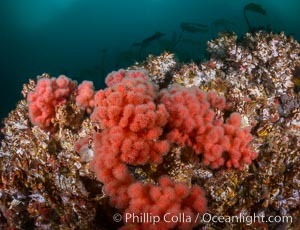 Pink Soft Coral, Gersemia Rubiformis, Browning Pass, Vancouver Island Gersemia rubiformis, Gersemia rubiformis Picture. 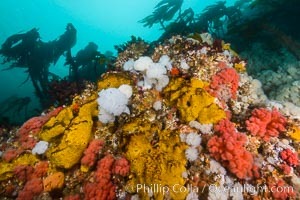 Colorful Metridium anemones, pink Gersemia soft corals, yellow suphur sponges cover the rocky reef in a kelp forest near Vancouver Island and the Queen Charlotte Strait. Strong currents bring nutrients to the invertebrate life clinging to the rocks. Stock Photography of Gersemia rubiformis, Gersemia rubiformis. 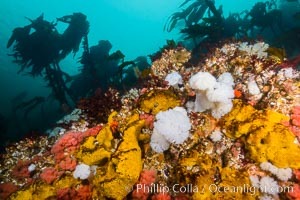 Colorful anemones and soft corals, bryozoans and kelp cover the rocky reef in a kelp forest near Vancouver Island and the Queen Charlotte Strait. Strong currents bring nutrients to the invertebrate life clinging to the rocks. Photograph of Gersemia rubiformis, Gersemia rubiformis. 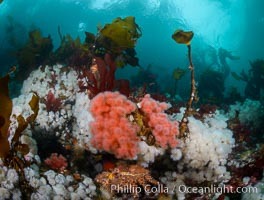 Colorful anemones and soft corals, bryozoans and kelp cover the rocky reef in a kelp forest near Vancouver Island and the Queen Charlotte Strait. Strong currents bring nutrients to the invertebrate life clinging to the rocks. Gersemia rubiformis, Gersemia rubiformis Photos. 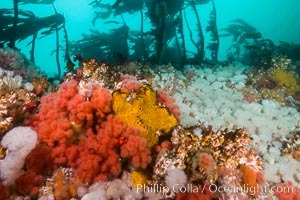 Colorful anemones cover the rocky reef in a kelp forest near Vancouver Island and the Queen Charlotte Strait. Strong currents bring nutrients to the invertebrate life clinging to the rocks. Gersemia rubiformis, Gersemia rubiformis Image. 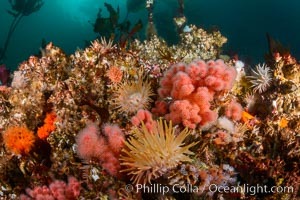 Colorful anemones and soft corals, bryozoans and sponges the rocky reef in a kelp forest near Vancouver Island and the Queen Charlotte Strait. Strong currents bring nutrients to the invertebrate life clinging to the rocks. Professional stock photos of Gersemia rubiformis, Gersemia rubiformis. 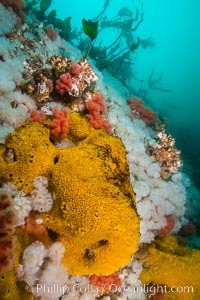 Colorful Metridium anemones, pink Gersemia soft corals, yellow suphur sponges cover the rocky reef in a kelp forest near Vancouver Island and the Queen Charlotte Strait. Strong currents bring nutrients to the invertebrate life clinging to the rocks. Pictures of Gersemia rubiformis, Gersemia rubiformis. 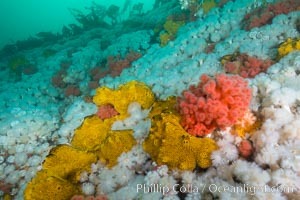 Colorful Metridium anemones, pink Gersemia soft corals, yellow suphur sponges cover the rocky reef in a kelp forest near Vancouver Island and the Queen Charlotte Strait. Strong currents bring nutrients to the invertebrate life clinging to the rocks. Gersemia rubiformis, Gersemia rubiformis Photo. 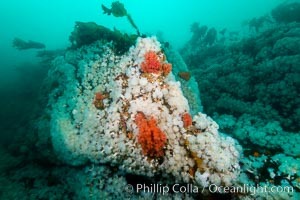 Rich invertebrate life on British Columbia marine reef. 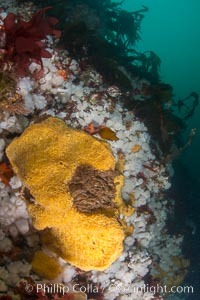 Plumose anemones, yellow sulphur sponges and pink soft corals, Browning Pass, Vancouver Island, Canada Gersemia rubiformis, Gersemia rubiformis Picture. 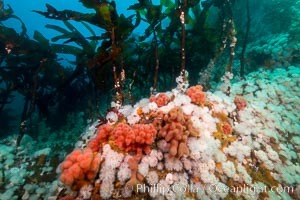 Plumose anemones and pink soft corals, Browning Pass, Vancouver Island, Canada Stock Photography of Gersemia rubiformis, Gersemia rubiformis. 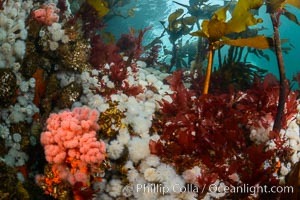 Colorful Metridium anemones, pink Gersemia soft corals, yellow suphur sponges cover the rocky reef in a kelp forest near Vancouver Island and the Queen Charlotte Strait. Strong currents bring nutrients to the invertebrate life clinging to the rocks. Photograph of Gersemia rubiformis, Gersemia rubiformis. 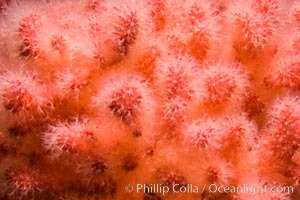 Pink Soft Coral, Gersemia Rubiformis, Browning Pass, Vancouver Island Gersemia rubiformis, Gersemia rubiformis Photos. Pink Soft Coral and Barnacle, Gersemia Rubiformis, Browning Pass, Vancouver Island Gersemia rubiformis, Gersemia rubiformis Image. 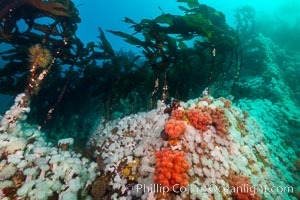 Plumose anemones, bull kelp and pink soft corals, Browning Pass, Vancouver Island, Canada Professional stock photos of Gersemia rubiformis, Gersemia rubiformis. Plumose anemones, bull kelp and pink soft corals, Browning Pass, Vancouver Island, Canada Pictures of Gersemia rubiformis, Gersemia rubiformis. 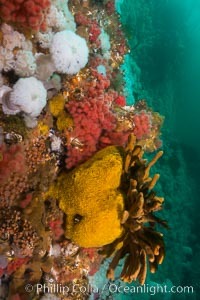 Colorful Metridium anemones, pink Gersemia soft corals, yellow suphur sponges cover the rocky reef in a kelp forest near Vancouver Island and the Queen Charlotte Strait. Strong currents bring nutrients to the invertebrate life clinging to the rocks. Gersemia rubiformis, Gersemia rubiformis Picture. 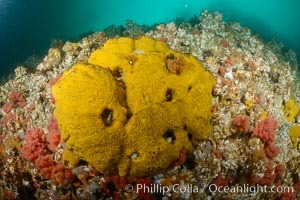 Rich invertebrate life on British Columbia marine reef. 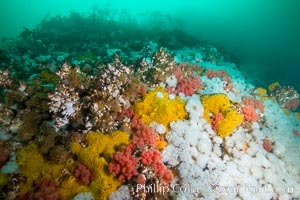 Plumose anemones, yellow sulphur sponges and pink soft corals, Browning Pass, Vancouver Island, Canada Stock Photography of Gersemia rubiformis, Gersemia rubiformis. 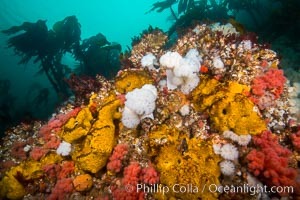 Rich invertebrate life on British Columbia marine reef. 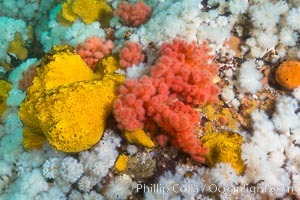 Plumose anemones, yellow sulphur sponges and pink soft corals, Browning Pass, Vancouver Island, Canada Photograph of Gersemia rubiformis, Gersemia rubiformis. 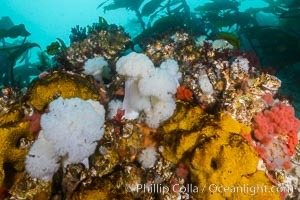 Rich invertebrate life on British Columbia marine reef. Plumose anemones, yellow sulphur sponges and pink soft corals, Browning Pass, Vancouver Island, Canada Gersemia rubiformis, Gersemia rubiformis Photos. 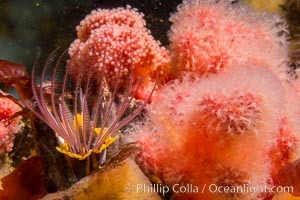 Rich invertebrate life on British Columbia marine reef. 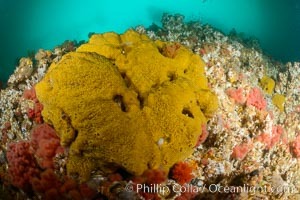 Plumose anemones, yellow sulphur sponges and pink soft corals, Browning Pass, Vancouver Island, Canada Gersemia rubiformis, Gersemia rubiformis Image. 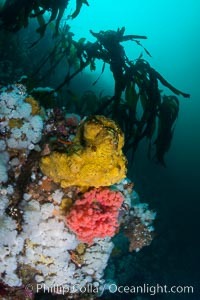 Colorful Metridium anemones, pink Gersemia soft corals, yellow suphur sponges cover the rocky reef in a kelp forest near Vancouver Island and the Queen Charlotte Strait. Strong currents bring nutrients to the invertebrate life clinging to the rocks. Professional stock photos of Gersemia rubiformis, Gersemia rubiformis.